It shouldn’t surprise me after all this time, but it does. 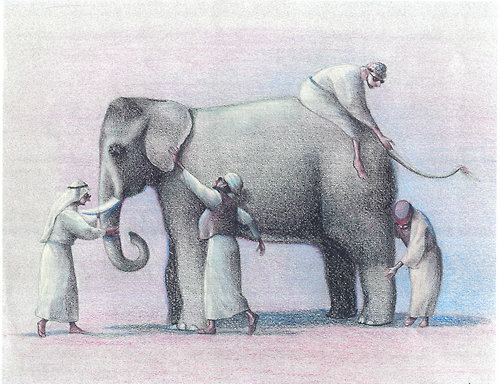 To be fair, knowledge management has been poorly defined and communicated in the external world, so it’s little wonder that people in organisations often approach it like the blind men and the elephant – each sensing a part, but not the whole, and drawing their own conclusions. 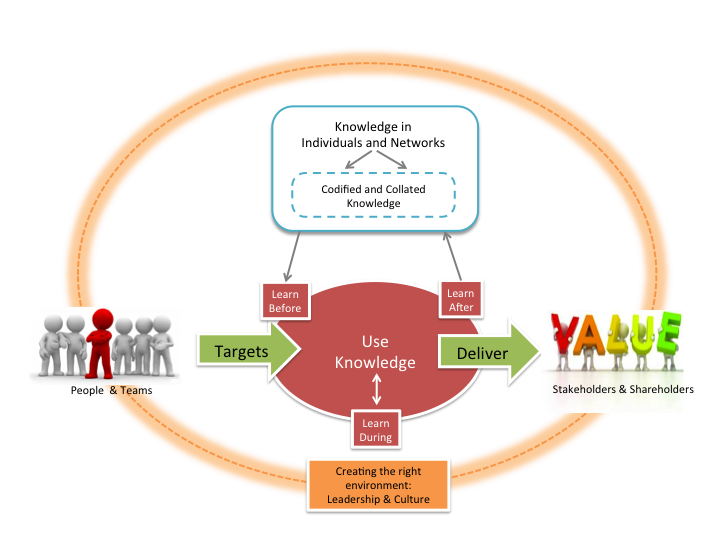 Here’s a holistic model for knowledge management. It isn’t new (it’s based on the model from BP in Learning to Fly)- but it’s still relevant and current today and does a good job of plotting a route through the KM landscape. Let me build it up for you. Start with the day-to-day matter of performance management and project management, where people and teams agree to goals and targets in order to deliver value which generally takes the form of profits for shareholders – or value for stakeholders. How do they do this? By using and developing knowledge – their own expertise, knowledge from the team, elsewhere in the organisation, from professional advisors or others outside the organisation. 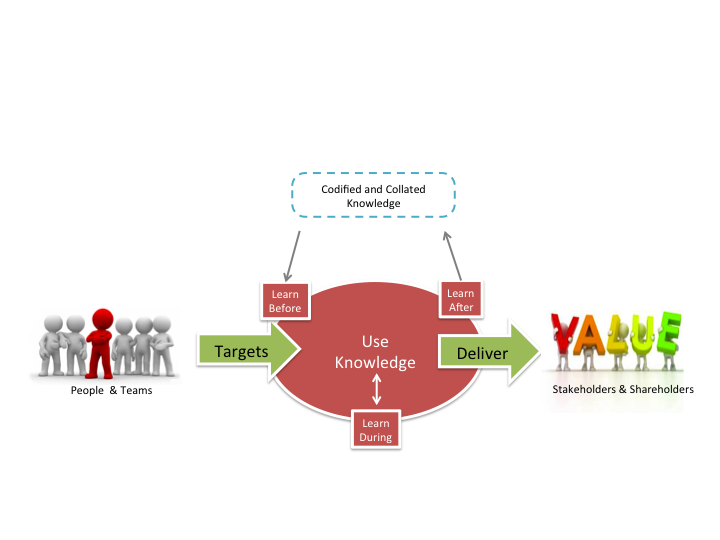 It’s a given that KM needs to connect directly to the goals and objectives of the organisation. So how does knowledge management improve, or accelerate the way in which they are achieved? Firstly, through the application of learning. Learning before, during and after activities. Without learning, we end up recycling old knowledge and documents – trapped between “connect and collect”, but not creating anything new. Learning before: how do we know that we’ve tapped into what the organisation already knows, and can we make sense of what it is knowing today? Learning after: how good are we at really learning and applying lessons from stories of personal experience? Learning during: do we have a culture of continuous learning, reviewing and improving? With processes for learning before and after in place, it’s important to manage the outputs of those processes – and to continue to refine, collate and curate a living, evolving, media-rich “knowledge bank”, from which withdrawals and deposits can be made. 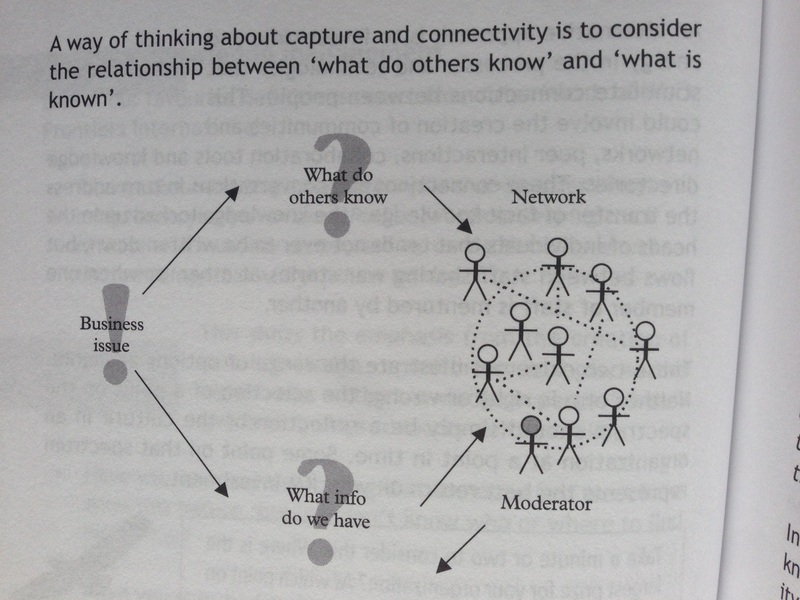 …but of course, the capture knowledge is just a shadow of the knowledge which will always remain in the heads of individual experts, and within networks of people with questions, answers, experience and ideas. The reserves in this human knowledge bank are far greater. These networks and experts play a vital role in collating and curating knowledge on behalf of the organisation. They have the current awareness and they understand the most pressing business issues. Who better to steward the knowledge than an emergent community of subject matter experts and practitioners? So now we’ve connected performance and project management with learning, learning with codification, and codification with networks, experience and expertise. The final part of the model recognises the role that culture and leadership behaviours and actions play to sustain an environment where these processes can thrive and interconnect. What motivates people to make the time to learn, connect and collate knowledge such that the value and efficiencies have a chance to flow through and create the stories to inspire others? How can leaders reinforce and role-model this? It can take a little time to give birth to this kind of a supportive culture – but then again, elephants to have the longest gestation period of any mammal, so we shouldn’t be surprised. Do you have more to know? I’m always embarrassed by my inability to speak another language, having never really progressed beyond my schoolboy French and Spanish. I’m frequently humbled by clients and friends around the world whose command of English and desire to learn more puts me to shame. I guess it’s one of the disadvantages of being a native speaker of the world’s accepted business language; it has led to linguistic laziness. When we think about the field of knowledge and knowledge management, the English language has particular limitations. The verb “to know” has to be stretched in a number of directions, and masks some important distinctions that other languages make. Connaitre/Conocer: These are used ot express knowledge about something or someone where we have some experience with the thing (or person). You can know, or be acquainted with, a book, a movie, a place, or a person. 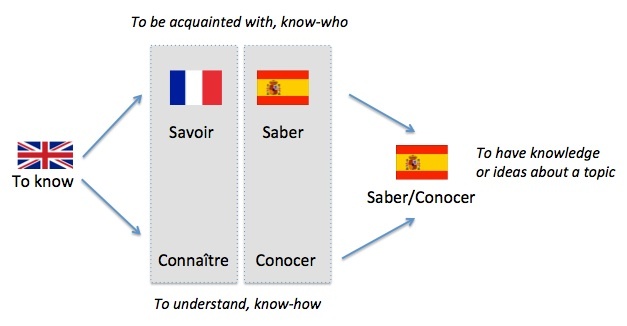 Savoir/Saber: These are used to talk about learned skills. You can know how to swim, draw, speak a language, etc. It is also used to ask about knowing about something, or knowing something by memory. Think about it for a moment – who would you rather get travel advice from: someone who knows about Madrid, or someone who is acquainted with Madrid? The conversations would be so different wouldn’t they? One is more transactional – almost a Google search. The other feels more like it would be a dialogue – a relational conversation. It’s a subtle distinction, but it’s a powerful one and one which needs to be embedded in our approach to managing knowledge holistically. We need to address conocer and caber, and find ways to bring them together. Where is the best place to bring together knowledge, ideas, new information and news about a subject? Well, a community of practice or a network seems like a good place to start. If this sounds familiar, and you’re a reader of “Learning to Fly” with a good memory, then it should do! So I guess we knew about this all along – we just weren’t fully acquainted with it. Last week the Daily Telegraph published an article about the “truth behind British politeness” which revisited the phrases which we British often use, the real meaning, and what (as the Telegraph charmingly puts it) “foreigners” understand. I’ve seen it printed off and pinned on the walls of several offices over the years – usually within easy view of the telephone. It’s a great (and humourous) way to help create understanding, enhance conversations and prevent people talking past each other. I’d even to so far as to say that it’s not bad! I like to think of them as scaffolding for knowledge sharing. It’s scaffolding which enables people to climb higher and faster to have richer conversations with deeper understanding. In each case the self-assessment tool was created by the group who would ultimately use it. That’s an important principle. They can recognise their own words – and the results of their discussions – in the practices chosen and the levels and language used to represent each practice. Creating a model together ia a tremendous way to have a group make explicit some of their knowledge, stories, assumptions and unarticulated rules of thumb. It gives a great sense of achievement – having rigourously discussed something they care about and understand deeply – and created an artefact which they can then use. We talk a lot about Communities of Practice – but sometimes communities never work the detail together on what their practice really is, and what good might look like. What a missed opportunity! Building a self-assessment model with members of a community forces a lot of helpful discussion, gives the group a product to be proud of and provides a very easy way for members to self-assess and then share their relative strengths and weaknesses in a knowledge marketplace. it also gives them a framework against which they can store share artefacts and examples (see the AIDS Competence knowledge asset example). Tools like the River Diagram and Stairs Diagram and reciprocal sharing techiques like Offers and Requests help to map out the dimensions of the marketplace ready for knowledge exchange. All of this sounds a lot more purposeful than hoping that needs and responses will serendipitously collide whilst we’re talking past each other… So with the greatest of respect, do you hear what I say? Making KM Fun and Tangible! I’ve been looking back on the highlights of the past year, and previous years, and it’s got me reflecting on the power of making KM engaging, fun and tangible in some way. Back in 2010, I wrote about KM Top Trumps, and how I used them with a group of business improvement professionals to help them get to grips with the breadth of KM tools and techniques available. I still use these today with groups. Social Network Mapping with the UN in Ethiopia. For several years now I have worked with the United Nations System Staff College on a KM leadership programme. This year saw me out in Ethiopia working with representatives from across the continent. Communities, Networks and Networking featured heavily in one particular module, and having contrasted the sharing and networking habits of birds, bees and sheep, we engaged in a practical Network Analysis exercise which brought the room to its feet, and put smile on every face. 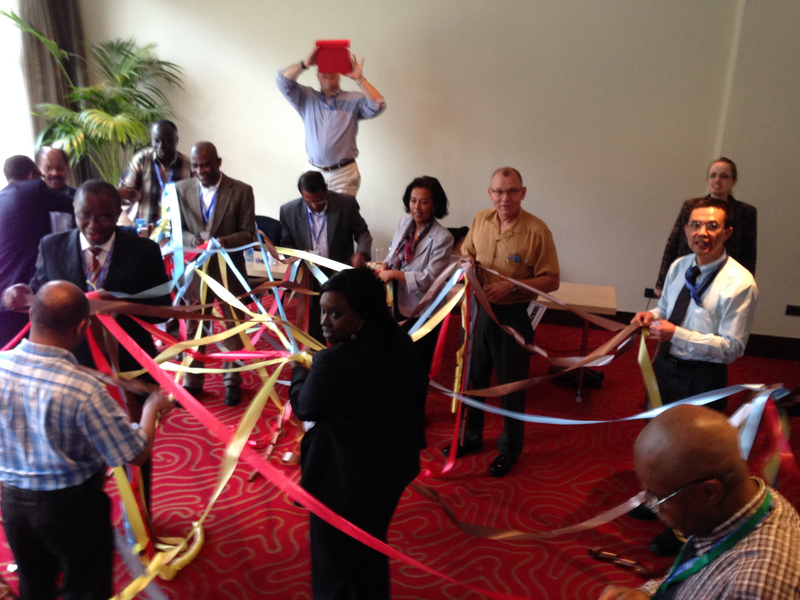 Each participant was given 5 coloured ribbons and asked to give one end to another colleague – the different colours indicated different relationships: for example: – Who have you known the longest? Who would you ask for technical advice? Who would you share an innovative idea with first? Energy levels rose instantly, accompanied by smiles and laughter. Once each ribbon had been shared, the group carefully lowered them to the floor and stepped out of the web, replacing themselves with their placenames from the tables. As a group, we could then stand around the pattern and discuss what it told us about the relationships, collaboration and knowledge flow. Snakes and Leaders – a creative way to explore the first 100 days of a community of practice. Syngenta have been a client for a number of years now, and have been looking for new ways to up-skill the core teams of their networks, especially in the early stages of growth. We worked together to document the ups and downs of network development during the first critical 100 days, and created a familiar-yet-different board game which embedded these critical moments, with one or two additional twists and turns. 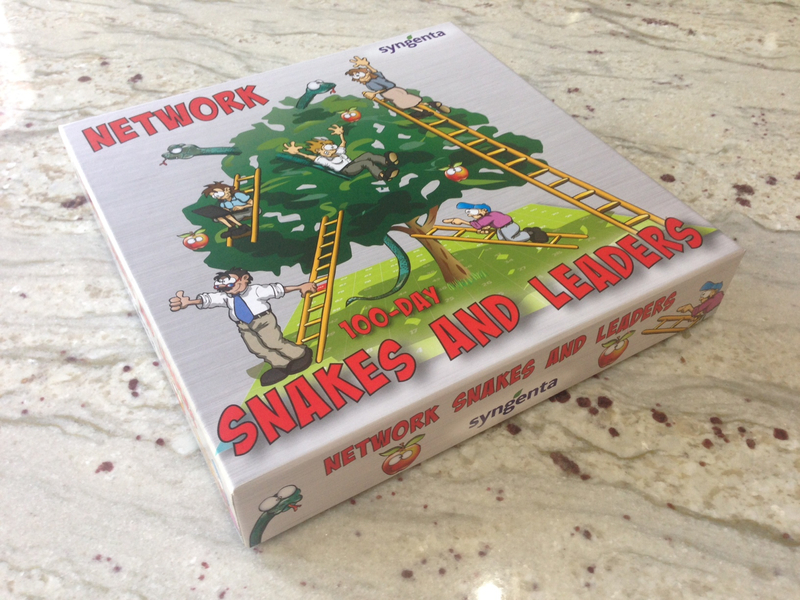 Creating the game together, and tailoring the rules for different parts of the business caused us to think critically about the non-negotiables and key principles of networks; probably one of the most enjoyable codification exercises I’ve been involved with. Thank you Syngenta! I’m looking forward to hearing how the game has gone down (or up!) this year. 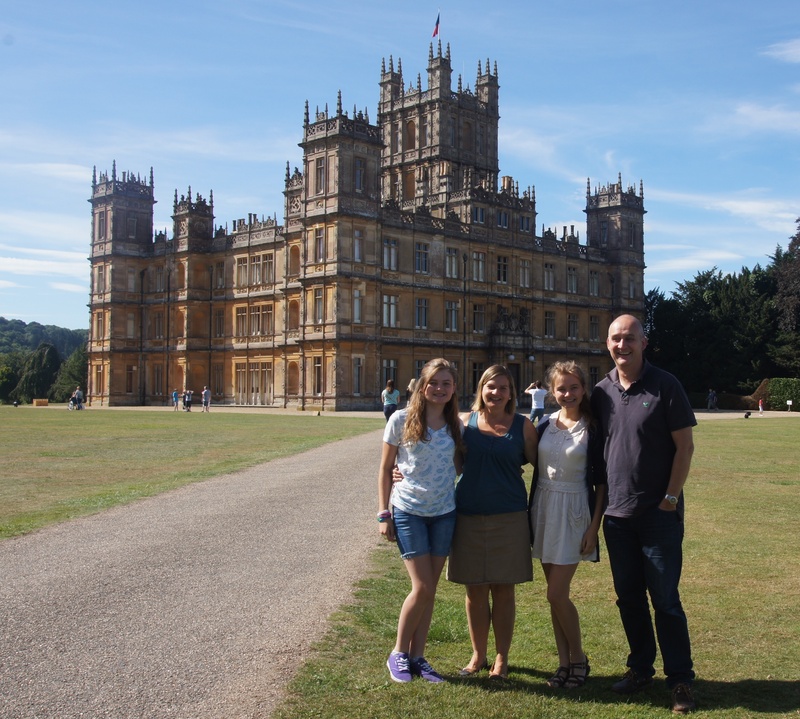 Downton Abbey, what you know, and what you’re known for. We couldn’t have been more wrong! It would be quite possible to tour the entire castle and completely miss its starring role in the TV series! Surely a missed opportunity by the owners, the Earl and Countess of Carnarvon? What’s your favourite flavour of KM? 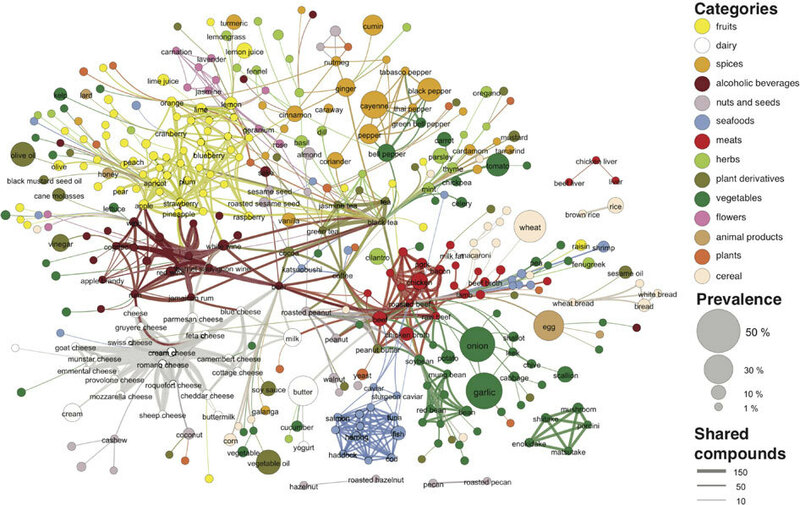 I’m a big fan of organizational network analysis. I think it’s one of knowledge management’s unsung heroes. I don’t know of any other KM or OD tools which can be as informative, revealing and engaging for clients, from a small amount of research input. 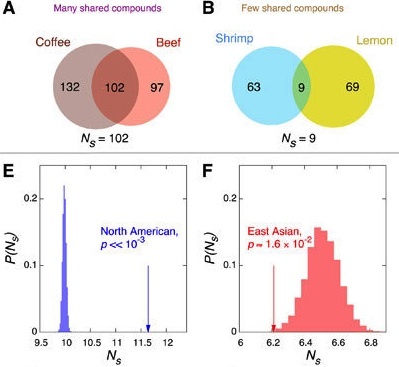 Coincidentally, later that day my daughter, who is a big fan of food science, showed me a fascinating Ahn Yong-Yeol article from nature.com which used network analysis to illustrate the connections between different ingredients used across thousands of recipes, based on their chemical similarities. “This looks like those pictures you create, Dad” she said to me. A more interactive infographic based on this data is provided in Scientific American here (snapshot below). The data is sorted to show the foods who share the most chemical compounds with others towards the top. Roast beef proves to be the food that does this the most, with strong chemical overlaps with coffee, soya-bean, peanut, beer, wheat bread and butter. In a way, it’s the grand-daddy of flavour. So next time you go into a pub, have some peanuts with your beer, some bread to start, with a tasty steak followed by a coffee – then chemically speaking, you’ve had a whole less flavour variety than you might think! This is why a well-planned peer assist will include sufficient diversity to avoid group-think, and why the design of communities of practice should thoroughly explore their purpose before they start recruiting members. A community focused on continuous improvement and giving and receiving technical help will benefit from being built from members with the same field of expertise – their shared practice. 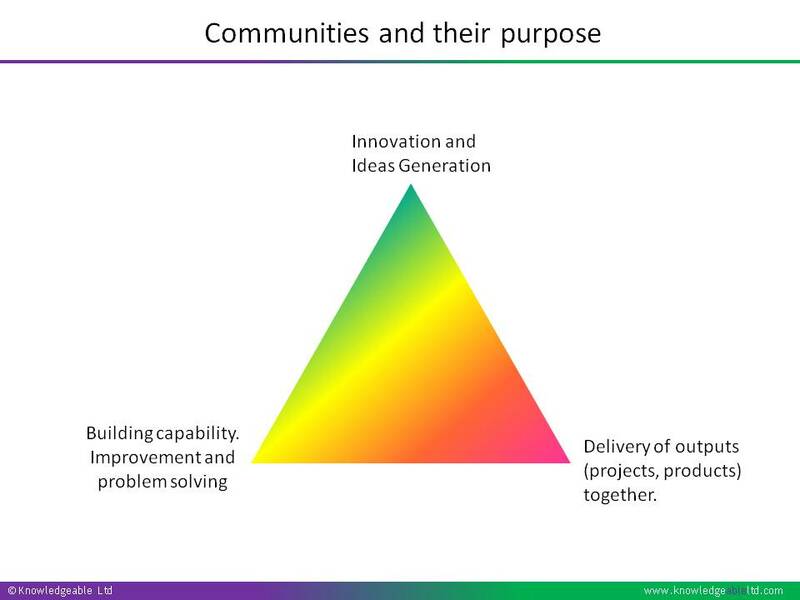 Communities often move along the axis at the bottom, shifting their mode from ad-hoc help and continuous improvement, to phases when the group is engaged in delivering something together (a policy, a white-paper, a set of recommendations, a good practice guide). This requires a temporary shift in leadership style, from social facilitation towards project management, but the membership is broadly unchanged. If the purpose of the community is re-defined as innovation or the generation of ideas, then you will probably want to extend the ingredients of the group to include people with a greater range of experience and different perspectives. Microsoft, Collaboration, Competition and how not to create a Knowledge-sharing Culture. So Steve Ballmer leaves Microsoft within the next year, and his epitaphs are already being cooked-up by many commentators. Most are lukewarm at best. I had the privilege to share a platform with Steve at a conference in the late 90’s. He was presenting Microsoft’s collaboration technologies at a groupware (remember that term?) event. Unfortunately, whoever prepared the laptop for their CEO’s presentation forgot to plug in the power supply. 10 minutes from the end of the presentation, there was an awkward moment when the “5% power remaining” message rudely appeared on the screen and a frantic Microsoft employee materialised at the foot of the podium asking to plug in the cable. He was waved dismissively away by Steve, who declared to the audience that it would be a good test of the battery life. The audience stopped paying attention to the content of the presentation, and started wondering with increasingly bated breath whether the battery would make it to the end. Happily, it lasted the distance. I’m not so sure what happened to that Microsoft employee though. Steve kindly provided a written endorsement for “Learning to Fly” which, at the time, was a bit of a coup for Geoff and me. However, reading the more recent articles about the culture of competition in Microsoft, I’m wondering whether he made it as far as the chapter on creating the right cultural environment for knowledge-sharing. while forced rankings can boost employee performance immediately after the system is introduced, the gains fall over time, with people more focused on competing with each other than collaborating. Slate.com revisited the fable of the two men running away from a bear. One stops to put on running shoes; the other says, don’t be crazy – you can’t run faster than a bear. He retorts, I don’t need to – I just need to run faster than you. So while Google was encouraging its employees to spend 20 percent of their time developing ideas that excited them personally, Ballmer was inadvertently encouraging his to spend a good chunk of their time playing office politics. Why try to outrun the bear when you can just tie your co-workers’ shoelaces? There were even cases of the most able engineers not wanting to be placed on projects with other high-calibre staff because they knew that they would be force-ranked against them at the year end. My favourite current example is Schlumberger’s approach to professional development which requires technical staff pursuing recognition as principals or fellows (the two highest positions on the technical career ladder) to have led a community of practice, to which they are democratically elected by members of that community. 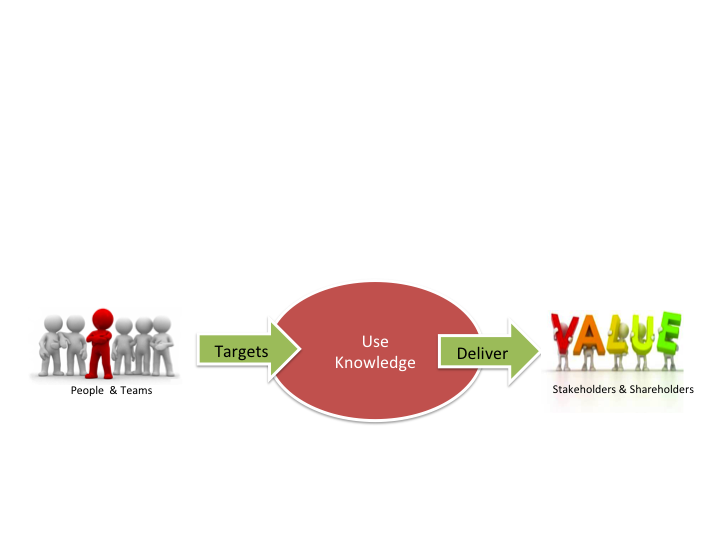 As a result, knowledge-sharing and collaborative behaviours directly influence technical promotion. You can’t be individually brilliant and make it to the top – you have to also be socially and behaviourally mature. All of this feels like a thousand miles from forced ranking bell curves, and it reminds me of the importance of KM partnering with and influencing HR and Talent Management – something which is still relatively unusual. Let’s hope that Steve Ballmer’s successor sees the connection between performance management and knowledge management, and executes a stack (ranking) dump! What's wrong with Lessons Learned? Part 1.